kady rain's new singles, bad kids, lonely one and it wasn't the roses are out now! 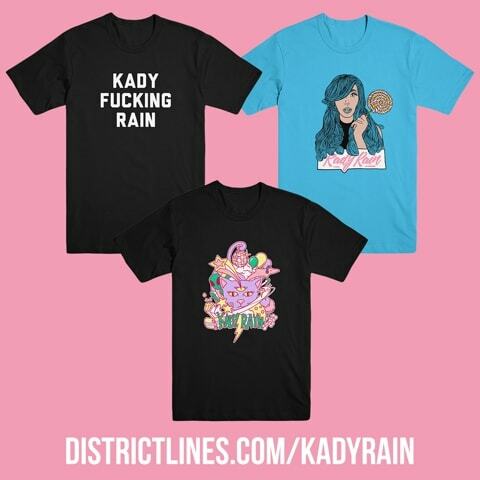 Subscribe to Kady Rain's Newsletter! We respect your privacy, for real. At 15, Kady started her first band, The Pickpockets. With rock n’ roll in her heart and a guitar strapped to her body, she played her first show at the Broken Spoke, a world famous honky tonk venue. Kady continued to play shows throughout high school, most notably at Ruta Maya. Kady cycled through a number of different musical projects as she went through her early twenties, including a short stint as the frontwoman for a sludge metal band, and a brief hiatus from normal life when she saved up enough money for a six-month road trip across the country. By the summer of 2014 however, Kady realized she needed to get serious about her career, and she already had someone in mind for her new project. Ben Bazzrea was staking his claim as a songwriter when he and Kady reconnected over a cup of coffee. They had worked together at Starbucks several years previously and would talk about pop music for hours during their shared shifts. After noticing the strong similarities between their visions, they decided to team up. Two years later, the All I Ever Wanted EP was released on August 26th 2016, to overwhelmingly positive reviews, with Wolf in a Suit naming Kady Rain one of The Top 5 New Indie Queens of Music. Fast forward two years, four remixes, an additional release and several million plays across all platforms later, Kady Rain is releasing new music May of 2018 with more music to come. Thursday, april 11th - opening for boyfriend - the parish - Facebook Event - buy tickets here! Saturday, April 20th - Microsessions - balance dance studios - buy tickets here! Saturday, May 4th - Goons Album Release Party w/ Cavern Company - Empire Control Room - Facebook Event - Buy Tickets Here! Tuesday, May 7th - Umlauf After Dark - Umlauf Sculpture Garden - facebook event - buy tickets here! For booking inquiries, please use contact form.